April 4, 2018. The frustration and fear in El Salvador was palpable among our grantees during my site visit in early March; the conservative ARENA party had won a majority of the municipal and legislative elections in El Salvador and, together with smaller conservative parties, would have a super majority in the Legislative Assembly, enough to turn back or impede any advancement for women’s sexual and reproductive rights during the next four years. 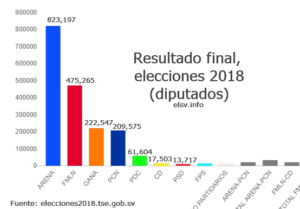 Two legislative initiatives to decriminalize abortion in specific cases are in jeopardy: one that was presented by Lorena Peña, then President of the Assembly for the FMLN, in October 2016 and the other presented by Johnny Wright Sol, Legislator for ARENA, in August2017. Both initiatives have been languishing in the Committee on Legislation and Constitutional Points while activists and their allies have been working to garner the votes to make decriminalization of abortion a reality. With the results of the election, it has become clear that the time is now, before new legislators take their seats in early May. This sense of urgency was evident at the march organized in commemoration of International Women’s Day (March 8). 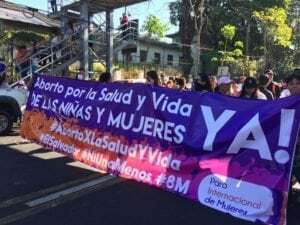 Thousands of women from all walks of life, representing the diversity of the Salvadoran women’s movement, took to the streets. Even though other issues were clearly present (violence against women, LGBTQ rights, economic justice) the overwhelming message was to decriminalize abortion for women’s health and lives. The expressions of activism to bring awareness to women’s sexual and reproductive rights during the week of my visit were varied. 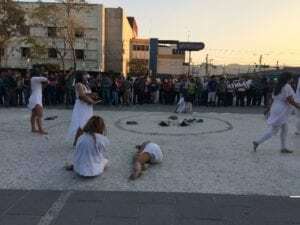 Wendy Aguilar, Program Officer for El Salvador, and I attended a public performance organized at dusk by Colectiva Amorales in San Salvador’s busy Downtown. The audience for the performance were mostly men who were passing through the central square on their way home from work. I was impressed to hear some of their comments: “they’re protesting against violence,” one whispered behind me to his friend. “They have a right to, the situation is terrible,” his friend whispered back. My visit in El Salvador ended with a strategy session to discuss our grantee partners’ next moves during this critical time. Though the momentum from the march did not translate into political agreements before the Holy Week recess (last week of March), we are hopeful that in the next month legislators will do right by Salvadoran women. You can find out more information about the fight to decriminalize abortion for women’s health and lives from our grantee partner: Agrupación Ciudadana por la Despenalización del Aborto Terapéutico Ético y Eugenésico or by visiting the Facebook pages of Jóvenes Voceras y Voceros por los Derechos Sexuales y Reproductivos.